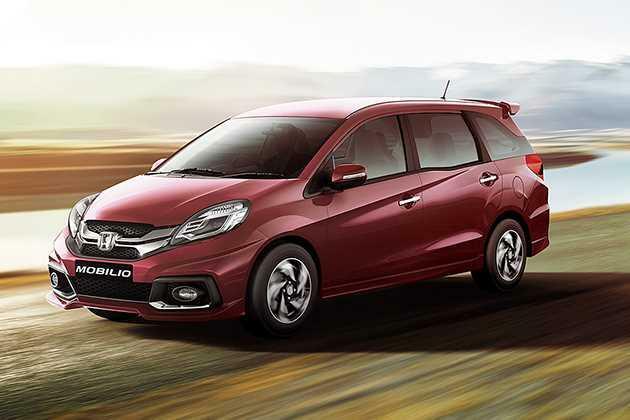 Honda Mobilio is a stunning multi purpose vehicle, which is launched by HCIL in both petrol and diesel engine options. It is available in quite a few trim levels out of which, Honda Mobilio E i VTEC is their entry level petrol variant. This is a five seater MPV, which is incorporated with a 1.5-litre, i VTEC petrol engine. It has four cylinders, each carrying four valves in it. This motor can displace 1497cc and is based on a SOHC valve configuration. The braking as well as suspension system used for this vehicle is quite efficient. The car maker offers this vehicle in seven attractive exterior paint options for the buyers to choose from. These include Majestic Blue Metallic, Carnelian Red Pearl, Alabaster Silver Metallic, Urban Titanium Metallic, Brilliant Gold Metallic, Taffeta White and Crystal Black Pearl. When it comes to exteriors, it has an amazing outer appearance, which keeps the car enthusiasts spell bound. It comes with a lot of remarkable features that further improves its look. Some of these include body colored bumper, black colored outer door handles, rear micro antenna and radiant tail light cluster. It comes with a spacious cabin that is incorporated with many notable aspects. It is decorated with a single tone color scheme that gives a pleasant look. The features like central locking, audio system, air conditioning unit, power outlet, cup holders and a few more are incorporated inside for the convenience of its passengers. The company provides a standard warranty of two years or 40,000 Km, whichever is earlier. This warranty period can be further extended for one or two years at an additional cost. This MPV is blessed with a robust yet eye catching body structure that is packed with lots of features. Starting with its front facade, there is a wide windscreen equipped with a couple of intermittent wipers and has a slanting bonnet with a few character lines on it. Next, it has a radiator grille with a thick chrome slat, which is neatly embedded with company’s insignia in its center. It is flanked by a well designed headlight cluster that further comes with halogen headlamps and turn indicators. Below this grille is a wide air dam fitted to the body colored bumper. It allows better air intake and cools the engine quickly . The side profile includes features like black colored outer door handles and external rear view mirrors. There are also neatly carved wheel arches which are fitted with a set of 15 inch steel wheels. These rims are further covered with radial tubeless tyres of size 185/65 R15 that ensures a superior grip on any road conditions. The company has also equipped it with a full size spare wheel in the boot compartment with other tools that help in changing a flat tyre. Its rear end looks decent with aspects like a body colored bumper, large windshield, high mount stop lamp and a tail light cluster. In terms of dimensions, it has a total length of 4386mm, width of 1683mm and a decent height of 1603mm. It comes with a large wheelbase of 2652mm and ground clearance of 189mm. On the other hand, its fuel tank has the storage capacity of 42 litres. The car maker has incorporated comfy seats in the roomy internal cabin, which easily accommodates at least seven persons. Its interiors are beautifully decorated with a single tone beige color scheme. The premium fabric upholstery is used for covering the seats, which offer good leg room to its occupants. The second and third row seats are reclining and foldable as well. There is a three spoke steering wheel, AC vents, center console and an instrument cluster integrated to the dashboard . The important functions on instrument panel includes a tachometer, ignition key reminder, tripmeter, headlight off reminder, driver seat belt reminder, low fuel consumption display and a few others. The cabin further includes an air conditioning unit with a heater, day and night inside rear view mirror, cup holders and so on. This entry level variant is incorporated with a powerful 1.5-litre, i-VTEC petrol engine. It carries 4-cylinders, 16-valves and is integrated with an electronic fuel injection system. It helps in giving a mileage of about 17.3 Kmpl, which is quite decent. This mill is capable of producing a peak power of 118bhp at 6600rpm and generates 145Nm of torque at 4600rpm. It is paired with a five speed manual transmission gear box that propels the vehicle into achieving a top speed ranging between 150 to 160 Kmph. It also has the ability of crossing the 100 Kmph speed barrier in about 13 to 14 seconds, which is quite good. This Honda Mobilio E i VTEC trim comes with an electric power steering system that is collapsible and tilt adjustable. It supports a minimum turning radius of 5.2 meters and makes handling easier. In terms of braking, its front wheels are fitted with disc brakes and drum brakes are used for the rear ones . On the other hand, a McPherson strut is affixed on its front axle, while a torsion beam is fitted on the rear one. It has several comfort features like a proficient air conditioning unit with heater, all four power windows with auto down function on the driver's side, central locking system, day and night internal rear view mirror, ECO lamp and fuel consumption display as well. Apart from these, it also includes a tachometer, cup and bottle holders, ignition key reminder, two interior cabin lights and a headlight off reminder. The list of safety aspects equipped in this Honda Mobilio E i VTEC variant includes an engine immobilizer, LED high mount stop lamp and Advanced Compatibility Engineering (ACE) body structure. It also has a driver seatbelt reminder, impact mitigating headrests and pedestrian injury mitigation technology that further enhances the safety quotient of this vehicle. 1. Attractive body design with remarkable exterior aspects. 2. A spacious cabin that is incorporated with sophisticated features. 1. Mileage can be improved. 2. Ground clearance can be improved.